I am so in love with how this turned out that I'm going to be making many more in the new year. I made this one as a quick gift, took me 1 1/2 hours from start to finish. I created this book for my brother and sister in law to capture a moment in their lives for the next year. So each side of a circle is a month. I wouldn't suggest doing anything larger than this, this is borderline too big but is still awesome. The next one I make I'm going to square off the bottom so that when the book is open it can be displayed across a mantel or tabletop. So here is how I got started. 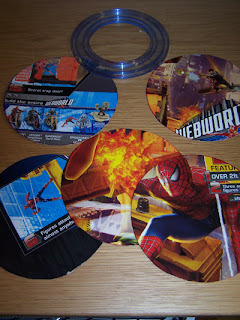 I used the box that my son's Spiderman playset came in and taking my creative memories circle shape cutter I traced the circles on the box with a sharpie marker and cut out with scissors. 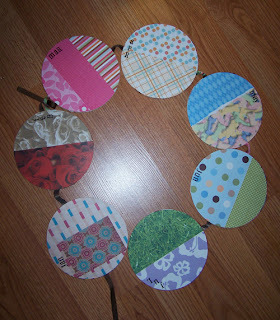 I then cut 2 inch pieces of ribbon to attach each circle. 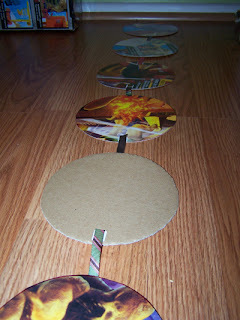 I alternated affixing them to one side of the circle and then the opposite side so that when you fold up the album it folds like an accordion. I first attached them with adhesive and when I knew it was what I wanted I went back and stapled each ribbon to the circle. I had to play with folding it a bit before I figured out what would be the front and back of the album. These circles need to be 2 circles that are attached together with ribbon so that the ribbon becomes the binding to keep the album closed. Once I had that figure out I labeled each circle. Since my album is to go in order of months once you open it completely. 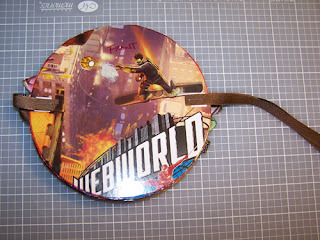 I then attached a longer piece of 5 inch ribbon to the front and back circles opposite the binding ribbon so that the album can be tied closed. Then I let my creative juices go wild and I designed each month's circle. I only used scrap paper to keep with my recycled theme. 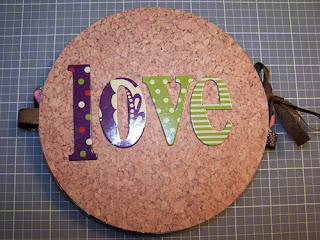 I hope the scrappers reading the blog give this a try, it's a lot of fun and so easy to make. I think the mini albums will make nice gifts throughout the year; birthdays, mother's day etc. Come back and share your creation in the comments section!